Last week I attended the LILAC 2014 conference. LILAC is the Librarians’ Information Literacy Annual Conference and this years event was held at Sheffield Hallam University. This was the second time I’ve attended the event. Last year I gave a talk on “When Staff and Researchers Leave Their Host Institution“. This year I provided a poster on “Preparing our users for digital life beyond the institution” which described follow-up work based on a survey on institutional polices on support for Cloud services. However my main activity at the conference took place on the first day when I ran a has-on session on “Getting to Grips with Wikipedia” and helped support LILAC’s first edit-a-thon on “Improving the Information Literacy Entry on Wikipedia“. What Did People Think of the Conference? I enjoyed the conference but unfortunately had to leave early on the final day. However since there were enough people at the conference who were using Twitter to share their thoughts on the various sessions I was able to view the summaries on my train journey home. I have found that Twitter can be a valuable tool for getting feedback when running workshop sessions. For example the tweets which were posted during a Wikipedia Editing Workshop session I facilitated last year at the SpotOn 2013 Conference were particularly useful as this was the first time I had led a Wikipedia editing session. I was able to view a Storify archive of the tweets after the event and, in particular, observe the timings when participants had created their Wikipedia profile page. Without that information I would not have known (or remembered) that participants were able to create their profile in 30 minutes. In the case of the #LILAC14 tweets it seemed to me that it would be interesting to see the tweets which were posted by conference participants after the conference had finished and they were willing to share their reflections on the event. 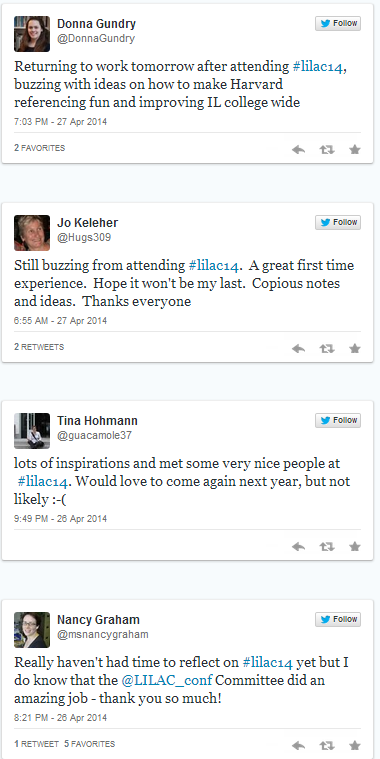 I have therefore created a Storify summary of reflective tweets about the LILAC 2014 conference. I would echo these comments and give my thanks to the conference organisers. Who, if Anyone, Should Archive Event Tweets? I occasionally here people question the value of event tweeting or archive of event tweets. However if sufficient number of people tweet at an event there can be value in an archive of the tweets, such as the evidence for event organisers in the participants’ thoughts on the event, as illustrated above. Catching up on awesome #lilac14 tweets. I’ve been hoping to go to this conference for years. Will make it my mission for next year! However it should be acknowledged that archiving event tweets may require an investment of time or money. Some Twitter archiving tools are licensed – for example, Eventifier, which was used for archiving 2,968 tweets and 105 photographs from the #LILAC12 conference, costs from $99 to archive a single event. Other archiving tools, such as Storify, may be free but will require time to be spent in manually curating tweets (as I did for the Storify archived described above). Some tools are free and will automatically archive tweets with minimal configuration needed. An example of this is Twubs which was used to archive #LILAC14 tweets. It therefore seems to me that event organisers should take responsibility for ensuring that there is an automated archive of event tweets. In addition event organisers may find it beneficial to ensure that they keep a manually created archive which can provide feedback on the event itself. But for events in which there are large numbers of tweets it may not be reasonable to expect busy event organisers to curate all tweets, especially tweets posted about parallel sessions. What can be done in such cases? 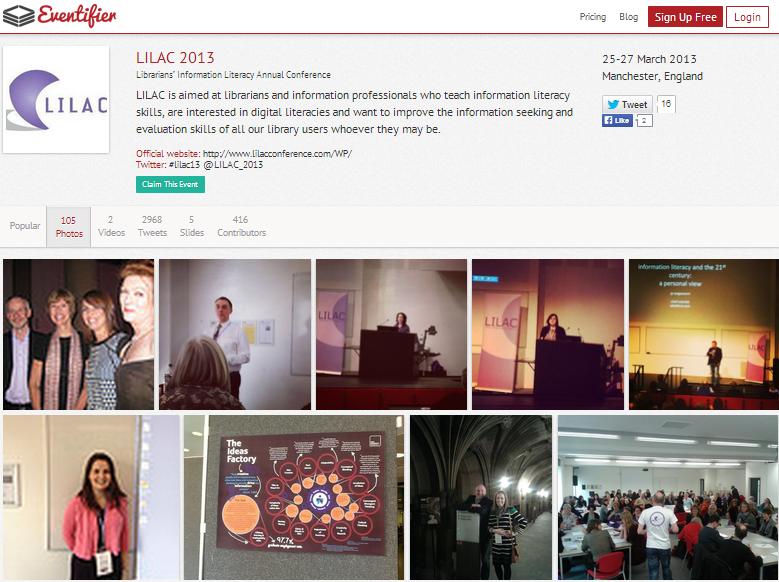 It seems that there were two Storify archives of a session held at last year’s LILAC conference. Perhaps the answer to the question “Who, if Anyone, Should Archive Event Tweets?” should be “Conference organisers will provide an automated archive of all event tweets and will encourage participants to curate an archive of tweets on areas of interest to the participants“. Note shortly after publishing this post was published I came across two Storify summaries were exemplified my proposal: Ned Potter (@theREALwikiman) (who didn’t attend the LILAC 2014 conference) published a summary of Susan Halfpenny’s talk on “The Contextagon”, a tool for identifying what you might need to consider for a literature review and Clare McCluskey (@librarygirl79) provided a comprehensive summary of the three days of the LILAC 2014 conference.